The last few months of 2018 were miserable, wet and autumnal, but temperatures did not really dip too much and remained several degrees above freezing. Plants and trees that would normally be dormant at this time of year were still alive and active. Of course, in the case of our vines, not only do the plants need to have a dormant period (helping to reduce bacteria and having a therapeutic effect), but freezing conditions can also help to kill off vineyard insects and pests. It was not until the New Year (quite literally from the turn of the year) that the skies cleared, to give us almost unbroken sunshine from dawn ’til dusk, and of course, with clear night skies, a drop in temperature. During the day the thermometer has been hitting the mid-teens in Centigrade (around 60°F), whilst at night it has just about reached freezing point – but certainly enough to give us ground frost in rural areas. 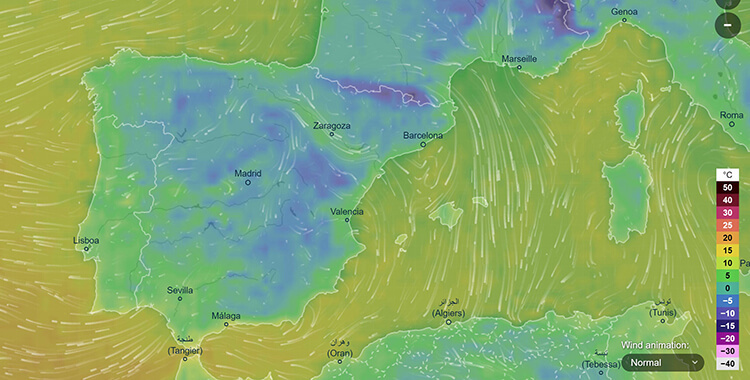 Although wind has not really been a feature, airflow has been from the north, providing us with a real nip in the air. The upside of this is, however, that it provides our guys with very pleasant conditions for pruning.